In a Sunday showdown at the Chizhovka Arena, the Czech Republic overcame a pesky Norwegian side, riding a first period tally by St. Louis Blues pivot Vladimir Sobotka to a 1-0 shutout victory. With netminder Alexander Salak starting his sixth consecutive game, the Czech Republic flew out of the gates; cashing in 39 seconds through the frame, Sobotka converted a Tomas Hertl feed for his first goal of the tournament. Assistant Captain Jaromir Jagr picked up the hockey assist, maintaining his point-per-game scoring pace. The second period saw a buzzing Czech side whip a game-high 15 shots at Norwegian keeper Steffen Soberg, only to have the 20-year old Washington Capitals prospect spite them at every turn. Matching his counterpart, Salak stood tall, staying sharp in a five-shot Norwegian period; turning aside a Ken Andre Olimb penalty shot, Salak carried a shutout bid into the third frame. Matching a game high eight shots in the third, Norway struggled to muster any sort of sustained effort in the Czech zone. Salak saw through his shutout effort, rejecting a total of 21 shots and closing the game with the Norwegian net vacant. 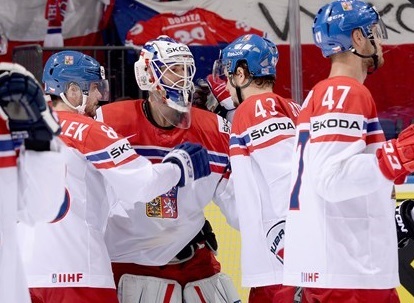 The victory elevates the Czech Republic to third in Group A; sporting a 2-1-2-1 record, Head Coach Vladimir Ruzicka’s men will look to solidify a playoff spot in Tuesday’s final preliminary clash against Cristobal Huet and France. Ridiculously injury-prone Business Administration major who tries to row, enjoys writing, digs rap, appreciates Chance The Rapper a tad bit too much, and loves the Florida Panthers. Spirit animal-Left Shark. Once set a food challenge record at some diner in High Springs, Florida. "Nice beard, dude"-Chadwick Stokes, Dispatch. Also enjoys long walks on the beach, guacamole and doing everything "for the bois".